Suffern is a village that was incorporated in 1796 in the town of Ramapo, Rockland County, New York, United States. As of the 2010 census, Suffern's population was 10,723. "The Point of the Mountains" or "Sidman's Clove" were names used in designating the present village of Suffern before the American Revolution. 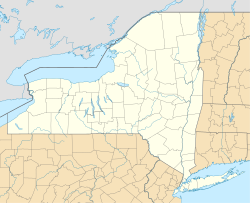 The area originally was inhabited by the Ramapough, a tribe of Munsee, who were a division of the great Lenape nation. Upon Sidman's death this land passed into the hands of his son-in-law, John Smith, who sold it to John Suffern. The village of Suffern was founded in 1796. John Suffern, first Rockland County judge, 1798–1806, settled near the base of the Ramapo Mountains in 1773, and called the place New Antrim, after his home in County Antrim, Northern Ireland, where his Huguenot ancestors had settled. New Antrim's location was considered strategically important in the Revolutionary War due to its location at an important crossroads near Ramapo Pass. General George Washington and other important military leaders used John Suffern's home as headquarters when they were in the area. Suffern is part of the Washington–Rochambeau Revolutionary Route National Historic Trail under the auspices of the National Park Service. This trail commemorates the route followed by General Washington and the French Comte de Rochambeau as they traveled to the siege of Yorktown, Virginia, which led to the end of America's War of Independence. Rochambeau made encampment with his 5,000 soldiers in Suffern on August 25, 1781, on his way to Yorktown and again on September 13, 1782, as he retraced his steps to return home. An historical marker on the Washington Avenue side of the Lafayette Theatre identifies this site of "Rochambeau's Encampment 1781–1782". At the time of the encampment, this site was directly across the road from village founder John Suffern's home and tavern where the comte de Rochambeau actually stayed. The Suffern Furniture Company is now located where this house once stood. During the war, Commander-in-Chief General Washington and his regiment made camp in the village several times. Lafayette Avenue, the main street of Suffern, is named in honor of Revolutionary War hero Marie-Joseph Paul Yves Roch Gilbert du Motier, better known as the Marquis de Lafayette. Other guests who took advantage of Suffern's hospitality included Lieutenant Colonel Aaron Burr, who later became the third Vice President of the United States; General George Clinton, who became the first (and longest-serving) elected Governor of New York, as well as the fourth Vice President of the United States (under both Thomas Jefferson and James Madison); and Alexander Hamilton, first United States Secretary of the Treasury under President Washington. From Suffern to Monroe was a main route of travel through the western Hudson Highlands. The main road was the Albany Post Road, one of the oldest roads in the state, which served as the stagecoach line between Albany and New York City and was heavily traveled in winter once the Hudson River froze. The 20 miles (32 km) of road through Ramapo Pass became the Orange Turnpike (now Route 17). Tolls were collected from 1800 until 1886 to maintain and improve the road. The New York State Thruway now runs through the pass. The south entrance to the town was garrisoned during the Revolution, with General Washington ordering as many as 400 soldiers to be stationed there at all times. The first railroad line across Rockland County, the Erie Railroad, was built in 1841 and ran from Piermont to Ramapo. By 1851, the line was extended to Lake Erie, and was considered an engineering marvel. The tracks are now owned by the Norfolk Southern line. In consideration for the right-of-way given it by Judge Edward Suffern, son of founder John, to lay track across his 6 miles (10 km) of land, the Erie Railroad named their depot "Suffern's Station", and the village became known as Suffern, not New Antrim as it had been called by John Suffern. In 1897, Avon Products, known then as California Perfume Company, built a 3,000-square-foot (280 m2) laboratory in Suffern; by 1971 the lab would grow into the 323,000-square-foot (30,000 m2) Avon Suffern Research and Development facility. In late 2005, construction was finished on a state-of-the art, 225,000-square-foot (20,900 m2) facility that would become Avon's global hub for research and development. The new building was constructed on the same site as their previous R&D facility, which was demolished for site parking. In 1916, what would become New York State Route 59, which reached from Nyack to Spring Valley in 1915, was extended to Suffern and Ramapo Hamlet. In 1924, the Lafayette Theatre, named for the Revolutionary War hero the Marquis de Lafayette, opened its doors. In 1972, the Salvation Army moved their School for Officer Training to a 30-acre (120,000 m2) site in Suffern. According to the United States Census Bureau, the village has a total area of 2.1 square miles (5.4 km2), of which 0.04 square miles (0.10 km2), or 1.42%, is water. Suffern is designated as a gateway to the Hudson River Valley National Heritage Area. As of the census of 2000, there were 11,006 people, 4,634 households, and 2,836 families residing in the village. The population density was 5,265.8 people per square mile (2,033.2/km²). There were 4,762 housing units at an average density of 2,278.4 per square mile (879.7/km²). The racial makeup of the village was 86.83% White, 3.53% African American, 0.26% Native American, 2.83% Asian, 0.09% Pacific Islander, 4.52% from other races, and 1.94% from two or more races. Hispanic or Latino of any race were 12.87% of the population. There were 4,634 households out of which 25.2% had children under the age of 18 living with them, 47.6% were married couples living together, 10.2% had a female householder with no husband present, and 38.8% were non-families. 32.5% of all households were made up of individuals and 12.2% had someone living alone who was 65 years of age or older. The average household size was 2.36 and the average family size was 3.00. In the village, the population was spread out with 20.1% under the age of 18, 7.4% from 18 to 24, 32.9% from 25 to 44, 24.7% from 45 to 64, and 14.9% who were 65 years of age or older. The median age was 39 years. For every 100 females, there were 92.1 males. For every 100 females age 18 and over, there were 89.7 males. The median income for a household in the village was $59,754, and the median income for a family was $74,937. Males had a median income of $46,959 versus $36,093 for females. The per capita income for the village was $29,208. About 3.5% of families and 5.7% of the population were below the poverty line, including 7.6% of those under age 18 and 6.4% of those age 65 or over. Novartis holds a manufacturing facility in the city, employing approximately 525 workers. In January 2014, the company announced closure of this facility by 2017, citing loss of patent exclusivity on Diovan as a major factor in the decision. :54 The facility is engaged in the "production of tablets, capsules, vials and inhalation products". :99 Avon's Global Research and Development facility is located in Suffern, employing 350 scientists and technicians in developing cosmetics. Suffern Middle School is the junior high school of the Suffern Central School District (SCSD), and is located in the Village of Montebello, adjacent to Suffern. It educates students from Airmont, Suffern, Montebello, Hillburn, Sloatsburg and parts of Monsey. It educates around 1,200 students in grades 6-8. A variety of subjects in the arts can be learned here, including band, orchestra, keyboard music, digital music, guitar, performance arts, and media arts. The middle school offers four languages: Chinese, Spanish, French, and Italian. The honors program begins at the seventh grade level and teaches advanced math and science to qualified students. There are many sports available at this school, and all home games are played at the school's large sports stadium, consisting of 2 astroturf fields, 2 soccer fields, a softball field, and a baseball field. A variety of sports are available for seventh and eighth grade students to play in three seasons; Fall, Winter and Spring. In the Fall, there is girls swimming, co-ed cross-country, boys and girls soccer, girls volleyball, and girls field hockey. In the wintertime, students can play girls and boys basketball, boys swimming (high-school team), and the co-ed ski team (high-school team). During the spring there is a co-ed track and field team and boys baseball team, among other sports. Many after-school programs exist, including the Technology Club, movie club, homework help, open gym, 6th grade play, and 7th/8th grade Spring Musical. Suffern Middle School is the first middle school in the world to have established a learning presence in the virtual world of Teen Second Life. The virtual presence is called Ramapo Islands. The village is home to Richard P. Connor Elementary School, also part of SCSD. Viola Elementary School is located in the neighboring CDP of Viola. High school students are zoned to Suffern High School. In 2013, Cherry Lane Elementary School, located in the neighboring Village of Airmont and part of SCSD, became one of the Blue Ribbon School of Excellence Award winners awarded by the U.S. Department of Education. Rockland Community College, part of the SUNY system, is located just outside the village limits. The Village of Suffern's chief executive is the mayor. Currently, the mayor is Ed Markunas. The Mayor presides over a Village Board consisting of 4 Trustees. Currently, the Trustees are Deputy Mayor Frank Hagen, Moira Hertzman, Paul Girard, and Steven Alpert. The village is represented in the United States House of Representatives by Nita Lowey. In state government, it is represented by Senator David Carlucci and Assemblywoman Ellen Jaffee. Suffern falls within the borders of the town of Ramapo, previously run by Supervisor Christopher St. Lawrence until his conviction on 20 federal corruption-related charges on May 19, 2017. Ramapo Deputy Supervisor Yitzchok Ullman is currently the acting Town Supervisor until either the Ramapo Town Board appoints a new supervisor, or until the November 2017 general election. The village is represented in county government by County Executive Ed Day and Legislators Alden Wolfe and Charles Falciglia. William Caesar Augustoni, American film producer, director, actor and works with Hollywood special effects as well as pyrotechnics. Virginia Menschner, Pass in 2018 while serving as Suffern Village Clerk, a position she held for the 60 years. Manifest: parts filmed near Soldier's Monument. Suffern station serves both local and express trains, operated by New Jersey Transit to Hoboken Terminal with connecting service at Secaucus Junction to New York's Pennsylvania Station. Most New Jersey Transit Main Line trains terminate at Suffern; some Bergen County Line trains also terminate at Suffern; and Metro-North Railroad's Port Jervis Line trains continue into Orange County to Port Jervis. Transport of Rockland buses serve Suffern, as do the Bergen County routes of Coach USA ShortLine. U.S. Route 202, New York State Route 59, Interstate 287, and Interstate 87, also known as the New York State Thruway, go through Suffern. Suffern's Tavern Site, Washington and Lafayette avenues – Suffern's tavern sheltered many Continental Army officers, including Gen. Washington and Aaron Burr, commander of the troops guarding the Ramapo Pass. Torn down about 1856. Brooklands Park – Lake Road – Site of Brooklands, home of Daniel Carter Beard, a founder of Boy Scouts of America. Hudson River Valley National Heritage Area – Suffern is a designated gateway to the HRVNHA. Lafayette Theatre – 97 Lafayette Avenue. Rockland's only surviving movie palace, opened in 1924, and having a renovated 1931 Wurlitzer pipe organ installed by the American Theatre Organ Society in 1992. Suffern Free Library – 210 Lafayette Avenue. The Ramapo Room contains historical books, clippings and photographs of western Ramapo. Suffern Village Museum – 61 Washington Avenue – Exhibits relating to the history of Suffern and the Ramapo area. Includes displays relating to American Indians, original Avon products, nearby iron mines, and Dan Beard, one of the founders of the Boy Scouts of America. Traveling Trunk program is available for classroom use. ^ a b DP-1: Profile of General Population and Housing Characteristics: 2010 from the 2010 Demographic Profile Data, United States Census Bureau. Accessed September 26, 2017. ^ a b c "Annual Estimates of the Resident Population: April 1, 2010 to July 1, 2016". U.S. Census Bureau, Population Division. May 2017. Suffern village, New York. Retrieved December 21, 2017. ^ a b Suffern, Carolyn (September 23, 2010). "John Suffern, of Suffern, NY" (PDF). The Washington-Rochambeau Revolutionary Route Association, Inc. Archived from the original (PDF) on September 15, 2012. Retrieved October 31, 2015. ^ "Population (00171811ch01.pdf)" (PDF). United States Census Bureau. December 15, 1922. p. 70. Retrieved December 21, 2017. ^ "New Hampshire - New York (10612982v3p2ch03.pdf)" (ZIP). United States Census Bureau. p. 296. Retrieved December 21, 2017. ^ "Number of Inhabitants, New York (37749573v1p34ch2.pdf)" (ZIP). United States Census Bureau. p. 24. Retrieved December 21, 2017. ^ "1990 Census of Population and Housing, Population and Housing Unit Counts, New York" (PDF). United States Census Bureau. September 29, 1992. p. 29. Retrieved December 21, 2017. ^ "Profiles of General Demographic Characteristics, 2000 Census of Population and Housing, New York" (PDF). United States Census Bureau. May 2001. p. 1915. Retrieved December 21, 2017. ^ a b "Novartis Shutting Down Suffern, NY, Plant". News: Bioprocessing. Gen. Eng. Biotechnol. News (paper). 34 (4). February 15, 2014. p. 24. ^ a b "FORM 20-F". EDGAR. U.S. Securities and Exchange Commission. January 29, 2014. ^ "Leading Global Brands". Avon Products. Avon Products. July 28, 2014. ^ "Suffern Central". Our Schools (dropdown menu). Retrieved December 21, 2017. ^ "Map and Directions". Suffern Central School District. Retrieved December 21, 2017. ^ "National Blue Ribbon Schools Program: Schools Recognized" (PDF). U.S. Department of Education. Retrieved October 31, 2015. ^ Holden, Stephen. "Leaping Slowly From Theater to Cabaret", The New York Times, September 1, 1989. Accessed September 26, 2017. "'Instead of the Beatles and the Stones, I grew up listening to Ethel Merman and Mary Martin. And because I was only 30 miles away from the city, in Suffern, N.Y., it seemed natural that I go to New York City after high school.'" ^ Robinson, Alex. "Boy Scout leader remembered with street co-naming", TimesLedger, June 30, 2014. Accessed September 26, 2017. "He was born in Kentucky and later moved to New York City, living in Flushing, where he founded the Sons of Daniel Boone, before he moved to Suffern, N.Y."
^ Anderson, Dave. "Opinions From Some Umpires in Exile", The New York Times, April 8, 1979. Accessed September 26, 2017. "They were sitting around after dinner in Marty Springstead's home in Suffern, N.Y., between Yankee Stadium picketing assignments." ^ Croke, Karen. "Grace VanderWaal won 'AGT' one year ago, Sept. 14, 2016", The Journal News, September 14, 2017. Accessed September 26, 2017. "One year ago tonight, Grace VanderWaal, a talented but then unknown middle school student from Suffern, won the biggest prize of her then young life: The $1 million grand prize on America's Got Talent." ^ Armstrong, Kevin. "Colorado manager Walt Weiss, raised in Suffern, living the mile-high life with Rockies", New York Daily News, May 11, 2013. Accessed September 26, 2017. "Durability was always a point of pride for Weiss as baseball carried him to all four corners of the country. Born in Tuxedo, N.Y., and raised in neighboring Suffern, 35 miles north of Manhattan, he reported to the home dugout inside parks from Pocatello, Idaho, to Huntsville, Ala., to Tacoma, Wash., to Oakland, Miami and Atlanta." ^ Roberts, Karen. "De Niro movie 'The Irishman' filming in Suffern", The Journal News, September 21, 2017. Accessed March 19, 2019. "De Niro movie 'The Irishman' filming in Suffern"
^ Suburbarazzi. "CBS series filming in Suffern Oct. 18", The Journal News, October 18, 2018. Accessed March 19, 2019. "CBS series filming in Suffern Oct. 18"
Wikimedia Commons has media related to Suffern, New York. Wikivoyage has a travel guide for Suffern. This page was last edited on 10 April 2019, at 05:30 (UTC).